A few RMT union members were gathered at Brighton railway station on the picket line to mark the start of their three day strike over proposed changes to the role of guards on Southern trains. Garry Hassell, from the RMT, said he knew the disruption was difficult for commuters, but the strikers were hoping to achieve a long term goal..
Three days of strike by the RMT union began today as part of an ongoing row over planned changes to the role of the conductor. 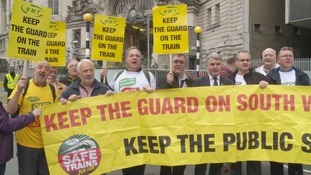 RMT General secretary released a statement calling on the government to meet with union members to end the disruption. Our guards members on Southern Rail remain rock solid and absolutely determined in their action in defence of rail safety this morning. Passengers are being advised to check their journey before travelling. Commuters are facing a miserable journey this morning as a three-day strike begins in protest over driver only trains. Striking lecturers in Oxford are to target a graduation ceremony later. They'll be leafleting students and guests as part of their dispute about pay. Union members in the city are in the first wave of institutions taking part in the action. At Oxford Brookes University, union members will target students and their guests as they enter the Headington campus on Gipsy Lane. "Our action will undoubtedly be disruptive to this prestigious university event but employers must learn they cannot continue treating us with contempt and ignoring the erosion of our pay, particularly given the spiralling cost of housing in Oxford." It's a bitter rail dispute that's causing travel misery for thousands of the South's commuters. Services on Southern Trains have been crippled for weeks due to an industrial dispute over the planned role of conductors. Southern has revealed an average of almost 250 trains every day are being cancelled. Ahead of a third day of strike action next Tuesday, union leaders claimed that Southern bosses are deliberately cancelling trains. But the company's chief executive denied that, saying it will now impose the changes. Our Transport Correspondent Mike Pearse reports. Workers on Southern Railway are to stage a fresh strike on 21 June in the row over staffing, the company announced. The Rail, Maritime and Transport union has been in dispute over the role of conductors, and its members have already taken strike action. People who use Southern train services had some good news today. Talks about ending strike action by guards are to be held this Friday. Yesterday long queues and hundreds of cancelled services - 700 of them - made getting around impossible for many. Mike Pearse reports. As junior doctors took part in the first all-out strike in history amidst questions about patient safety, GP trainee Cara Neal explained her motivation for striking. "Whilst I was a medical student my dad died in this hospital in the A&E. And I can't tell you how hard it was to walk in the door and work in A&E where I knew my dad had died. "So if Jeremy Hunt or David Cameron thinks we are going to give up, we're not. Because that took the most guts I've ever had to have, and this is nothing. I will keep striking, I will keep going." "I truly believe this is going to be the final nail in the coffin for an NHS free at the point of access. The amount of despair that I have seen in my colleagues is going to mean we can't fill the rostas to a safe level. And that will be the point at which they swoop in and we become a different health service that we don't want". Hundreds of hospital appointments have been postponed across the south east as junior doctors take part in a forty eight hour strike. It's the third walk out in a continuing dispute with the Government over pay and working practices. The Health Secretary, Jeremy Hunt, wants to push through a new contract which includes weekend working. But doctors say they will be over-stretched. Tom Savvides has the latest. Junior doctors across the South East walked out for a second 24-hour strike today amid the ongoing row with the Government over pay and weekend working. Operations, check-ups and tests have been cancelled as a result of the industrial action, which started at 8 o'clock this morning. Junior doctors have been at picket lines outside many of the region's major hospitals today including Brighton, Tunbridge Wells, Maidstone and Ashford - but Accident and Emergency departments were staffed as usual. Sarah Saunders reports.